General Manager Report - January 2019 - Sun City, Arizona - The Original Fun City! The Recreation Centers of Sun City, Inc. (RCSC) has ended 2018 within its operating and capital budget year to date. Every division has met or exceeded its net operating budget projections for 2018. Payments on past due assessments in December were 10% of past due balances. Overall accounts receivable increased in December by 2.4%. Past due assessment balances remained unchanged this month. Total accounts receivable increased this month due to Current assessment increases. November assessments went 30 days past due at a reduced 4.7% rate and October assessments went 60 days past due at a higher 3.9% rate. Total accounts receivable balances decreased by 10.7% at the end of 2018 and were the lowest end of year total since 2010. 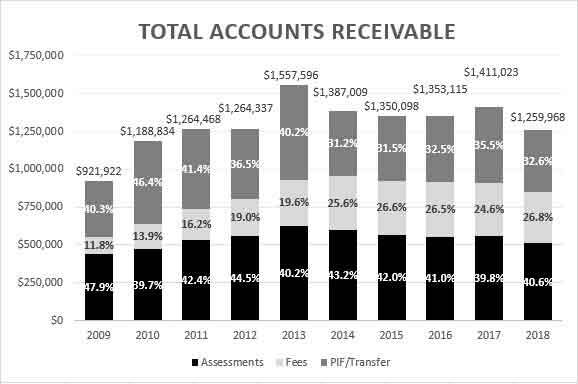 The graph shows the total accounts receivable over the past decade along with percentages that make up the totals. Payments from our third-party collections firm ended the year strong and totaled $33,808 in December. Payments for 2018 through our third-party collections firm totaled $208,954. This equaled 2016 and was 21% higher than 2017. Payments made in December by Cardholders through the online RCSC Web Portal were down and totaled $91,022 from 220 property owners. Despite ending the year soft, web portal payments made in 2018 were the highest annual amount and totaled $1,382,234 from 2,991 property owners. These totals represent an 18% increase over 2017. In December, property transfer balances increased nominally and lender related balances decreased by 8.6%. Outstanding balances related to property transfers represent 53% of all receivables and 55% of past due balances. At the end of December, trustee sale notices on Sun City AZ properties ended at 47 and properties owned by lending institutions decreased to 2. RCSC’s employee benefits package offers full time employees the opportunity to participate in a Flexible Spending Account available through Section 125 of the Internal Revenue Code. Employees can set aside an elected amount of money for out of pocket medical expenses on a pre-tax basis of up to $2700 this year. The elected amount is then deducted from paychecks over 24 pay periods. Twenty-eight employees elected to participate this year for a total amount of $53,108. This is a win-win situation, while the employees never pay taxes on the elected amount, the Corporation realizes a $4,063 tax savings this year. Employees are also offered an opportunity to realize a $50 per month savings on their share of premium for medical insurance coverage through RCSC’s health and wellness program. The program is designed to engage individuals in taking charge of their own health and wellness through annual biometric screenings that measure blood pressure, blood glucose and cholesterol levels. Weight, height & waist circumference measurements are also included. One hundred employees participated in the screening clinic held in January. After receiving results, individuals completed a BlueCross/Blue Shield online health assessment. We began the year on January 7 and 8 with our annual Club Officers training. The training was informative, concise and well received. On Wednesday, January 9, we kicked off the ticketed concert series at Sundial Auditorium. The room was filled with laughter and applause as Tom Stevens and Tony Lewis brought back the magical memories of the legendary Dean Martin and Jerry Lewis. The following Wednesday, January 16, we welcomed hundreds of new and current residents to Discover Sun City AZ. There were 148 clubs and organizations present to inform all in attendance just what Sun City AZ has to offer. On Wednesday, January 23, the Manilow and Midler tribute captivated the audience with a stellar performance. Followed on Wednesday, January 30, with a tribute to ELO with Electric Light Overture which brought all of those great ELO hits from the ‘70s back to us with spot-on sound, wardrobe and full instrumentation. Be sure not to miss any of these wonderful performances this season! Get your tickets at the Clubs and Entertainment Office located at the Lakeview Recreation Center. Please join us on Monday, February 25 at the Sundial Auditorium for the RCSC Annual Membership Meeting. Registration and refreshments are at 6pm and the 2019 Budget Presentation & Membership Meeting begins at 6:30pm. Your RCSC Member Card (with photo) MUST be presented at time of registration. Last, but certainly not least, on Thursday, February 28 at 3pm we will welcome to the Sun Bowl stage The Commanders Jazz Ensemble of the USAF Band of the Golden West. This is a free event and there will be food trucks on site for your dining pleasure. For those who may not be aware, the monthly management reports are available on our website www.suncityaz.org under the RCSC tab. Also, if you have not done so already, please sign up on the RCSC email list where you can designate topics of interest and stay in the loop with RCSC News Alert Emails!